It is reassuring to see such passionate cross-discipline students using their creative flair and ingenuity to find solutions to so many eco and social problems through business enterprise. The winning teams of the sponsored Individual Topic Competitions were also announced which amounted to over £75,000 of grant funding awarded by Enactus UK to university teams on behalf of its corporate partners. Iain Patton, CEO at EAUC and one of the judges at this year’s competition said: "It is reassuring to see such passionate cross-discipline students using their creative flair and ingenuity to find solutions to so many eco and social problems through business enterprise. The bright initiatives show how important is for students to have the opportunity to step out of the classroom and develop first-hand skills and the perspective that is essential to responsible leadership in an ever-more complicated and challenging world." We at EAUC are proud to have partnered with Enactus and develop a new institutional volunteering role - EAUC Sustainability Advisor (SA). We strongly believe this will be a great opportunity for EAUC members to connect with a group of sustainability engaged students and colleagues, to collaborate and develop further projects together. 2) Provide sustainability insights and expert advice to existing Enactus projects. 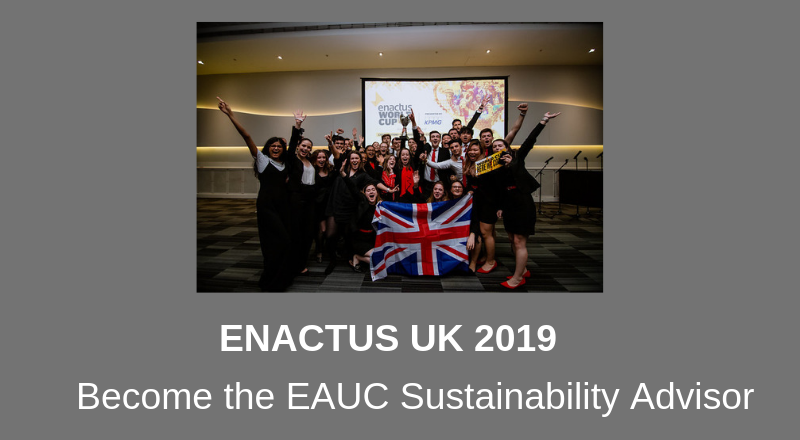 If you want to become the EAUC Sustainability Advisor for your Enactus team and support these exceptional student-led sustainability initiatives, please follow the instructions below and contact Enactus UK via Rosie Connolly - rconnolly@enactus.org.